You Are Here: Home » National News » Did you know UBER’S new CBO is an African Woman? A fierce one at that! Did you know UBER’S new CBO is an African Woman? A fierce one at that! Bozoma Saint John, Chief Branding Officer at Uber: Oh the joy! Wow! Uber is trying to shift their groove in a major way. Why come [sic] no big deal has been made about the fact that they’ve placed a gorgeous African woman from Ghana in the role of Chief Brand Officer with the company nearly four months ago? That’s like forever ago where news like this is concerned. 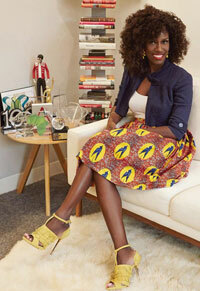 The ride-share company brought Bozoma Saint John on board this past June. Perhaps everyone was still distracted by Uber CEO, Travis Kalanick, who resigned in disgrace on June 21st after months of complaints about his controversial leadership ethics. But Saint John’s hiring alone kicks two big complaints about Uber executive staffing practices into another gear. One, she’s a woman (and we’ve heard the sexism accusations made public by female Uber ex-employees), and two, she’s far from Caucasian. Uber is not Saint John’s first time at bat with a huge company. She has been in executive roles at Pepsi, Apple Music and iTunes, and Ashley Stewart just to name a few. Heck, she once taught a college course on Tupac Shakur, led executives at Apple’s Worldwide Developers Conference on a sing-along to Rappers Delight and even scored a major move with Queen Bey. Is it any wonder she’s known as “Badazz Boz” online? Oh, but I am SO getting ahead of myself.